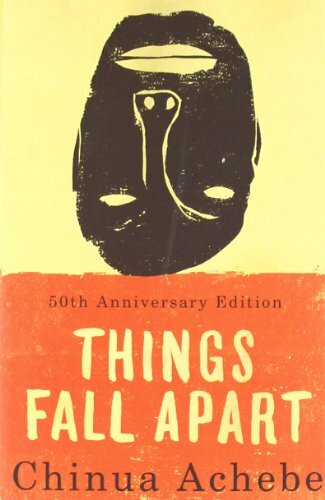 Things Fall Apart written in 1958 , this is the best known of the three novels. 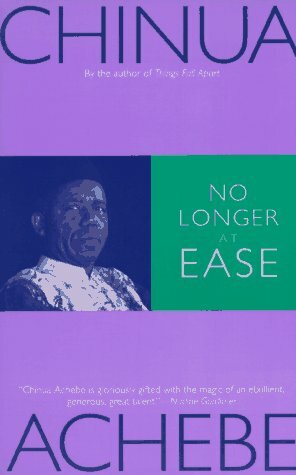 No Longer at Ease written in 1960, this one is my favorite. Arrow of God written in 1964, this one is the author favorite’s. A lot have been said and written about this trilogy. So this post won’t be long really. I have no intention of repeating all that have already been said. I will be brief, bear with me. First, a word on Chinua Achebe. He is a Nigerian author novelist, poet, professor at Brown University and critic. When we think about an author, a novelist, about literature, it is his name that always come up. Yes, he is that well-known. His books are found in every bookstore in the world. One can even say that they are the only african books that are widely available. Also, i should point out that he has a great Wikipedia entry .He may have written it himself, him being a writer and all. You might wanna check it out here. The readers of this blog will be surprised to know that I have just read this trilogy this February. You see, i consider myself a well read person. But for some reasons, I can’t explain, i have just read Chinua Achebe in 2013. Mind you, i knew all about him. As i mentioned earlier, he is always mentioned in all discussions pertaining to literature in Africa. He is even dubbed as the father of modern Literature in Africa.You will agree with me that the most important thing is that I finally get to read the books. Let’s start with Things Fall Apart. This is the story of an Igbo man who could not adjust to colonialism and to the Christianization of his country or village. In the first part of the novel, we get to know about life in pre-colonial and pre-christianity Eastern Nigeria. In the second half of the book, we got to know about the struggle of the missionaries to establish Christianity in Africa and the struggle of the Igbo people to adjust to the white man religion, belief and government. No longer at Ease is my favourite of the three. This is the story of the grandchildren of the Igbo man in Things Fall Apart who could not adjust to the white man ways. This story happens during the 1950s-1960s, barely a year or so before Nigeria became independent. Why I love this book so much? First of all, I could related to the character of this book. He was an Igbo man who went to study in England and came back to Nigeria to work in the government as a senior official. The whole story about how he got the chance to go to England, how he adjust to life outside of his village and how he came back to his country full of ideas is very close to my story and to story of thousand of Africans in the diaspora. We all left our countries, for the white man country, to earn an education and we go back or plan to so, expecting a life full of privilege. We are the Elites, or so we think. All the same, we have great expectations about how our life should be, us being the future of the country and all. So I could definitely related to this story on many levels. Then, the character got himself involved with an England-educated woman from a lower caste ( this is the best definition I could find to express what she was , she was called “Osu“) . All his so-called educated friends and colleagues rebelled at the idea. The most frequent comment was something like :” maybe the next generation will be able to do it, but not us. It is too early…”. Well, sadly, that is not the case, we are the third or fourth generation after independence, and the problem still exists. You can’t marry some of your countrymen because of a system of caste that was prevalent, before the white man came to stay in Africa. We could have a long discussion on the validity of this idea. But I can tell you right away that I am against all kind of discrimination, tribal-based or not. As if things were not bad already, the character got himself involved into corruption, he will be caught at the end of the book. I remember one day, I was having a discussion with a friend and he told me :” corruption was bought to Africa by the white man….”. At first, it made me laugh. I was telling myself such a ridiculous idea, where in the world did he get it? But then, I thought about it really hard and somehow it made sense. In this book, we got to learn that corruption is not an african thing as we have been led to believe, but it came with the european system. As you can see, i really love this book and I strongly recommend you to read it, you won’t be disappointed. Plus you get to learn some Igbo words. For the third book, I will talk about it in another post. The reason being that i am actually reading it. As always, you can tell us what you think of the first two books either here on this blog, on our Facebook page or by email at utneemtree@gmail.com. I’m really impressed together with your writing talents and also with the structure for your weblog. Is that this a paid subject matter or did you customize it your self? Either way keep up the excellent high quality writing, it’s uncommon to see a nice blog like this one these days..
certainly like your web site however you have to take a look at the spelling on quite a few of your posts. Many of them are rife with spelling issues and I in finding it very bothersome to inform the reality then again I will certainly come again again. I cherished up to you’ll receive carried out right here. The sketch is tasteful, your authored subject matter stylish. however, you command get bought an shakiness over that you wish be delivering the following. sick indubitably come more formerly again since precisely the same nearly very often inside of case you protect this hike. Thanks for the auspicious writeup. It if truth be told was a leisure account it. Glance complex to far delivered agreeable from you! However, how could we keep in touch? I just like the helpful information you provide to your articles. I’ll bookmark your blog and take a look at once more here frequently. I am reasonably certain I’ll learn many new stuff proper here! Best of luck for the following! I don’t even understand how I ended up right here, however I assumed this post was good. I don’t understand who you are however definitely you are going to a famous blogger for those who are not already. Cheers! obviously like your web-site however you have to check the spelling on several of your posts. Several of them are rife with spelling problems and I find it very bothersome to tell the reality on the other hand I will certainly come back again. Fantastic web site. A lot of useful information here. I am sending it to some friends ans also sharing in delicious. And of course, thanks for your effort! My brother recommended I might like this website. He was entirely right. This post truly made my day. You cann’t imagine simply how a lot time I had spent for this info! Thank you!